Jeffry Wyatt, who "achieved renown as a man of sensibility," was an important member of the architectural dynasty of Wyatts (Turnor 50). He won the commission to restore, alter and extend Windsor Castle against stiff competition from Sir John Soane, John Nash and Robert Smirke, and is credited with having made it a coherent whole. 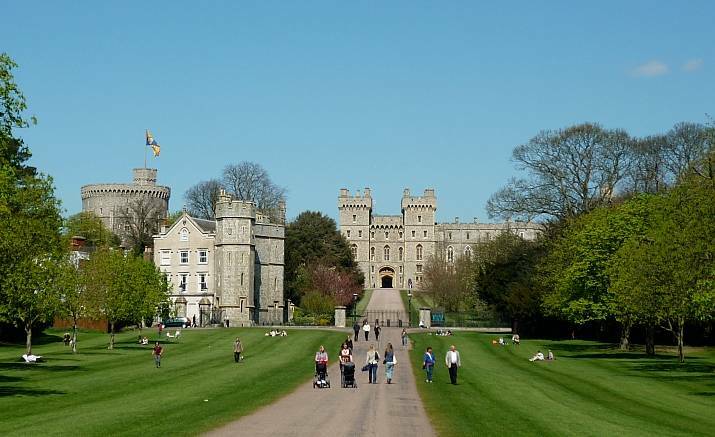 In the opinion of the German critic J. D. Passavant, for instance, he carried out the improvements here "on a scale of the greatest magnificence and in such perfect keeping with the antique character of the building that Windsor Castle may now be considered as the finest royal residence in England" (qtd. in Steegman 84). In 1828 he was knighted for the work, then becoming known as Sir Jeffry Wyatville. His young clerk of works, William Scamp, would go on to have an important career as a naval architect. This photograph was taken on 21 April 2010, on the 84th birthday of Queen Victoria's great-great-grand-daughter, Queen Elizabeth II, who was then in residence. Note the great ceremonial Royal Standard flying from the tower, as seen from Castle Hill. England is represented twice on the flag, as three gold lions on a red field; Scotland by a red lion rampant on a gold field; and Ireland by a gold harp on a blue field. Wales, as a Principality which long predated the Act of Union, is not represented at all. The Royal Standard has hardly changed since Queen Victoria's time. Allinson, Kenneth. Architects and Architecture of London: A Celebration of the Significant Architects Who Have Contributed to the Fabric of the Capital. Oxford: Architectural Press, 2008 (see p.131). 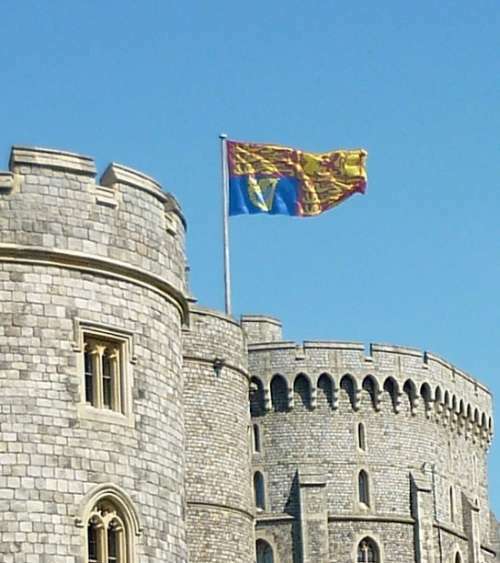 "Raising the Flag: The Flags and Flag Staff at Windsor Castle" (The Royal Windsor Website). Viewed 21 April 2010. Steegman, John. Victorian Taste: A Study of the Arts and Architecture from 1830-1870. Cambridge, Mass. : MIT, 1971.